Adam's Life Hacks Part One: Personal Wiki Time! Warning: personal wikis are much less useful today because we all use smartphones, and editing Mediawiki pages through the mobile web is too difficult. I now use my personal wiki to reference older content, and regretfully use Evernote for everything else. Evernote leaves so much to be desired! I use a mixture of methods to keep track of things in my life. At any given time I have todo items in my email, a Christmas card list scribbled on a piece of paper blotted with chicken tikka marsala sauce, and some note in my head that it’s time to take the car in for an oil change. Long term personal storage was always tough, though. Email isn’t good for long term storage because it’s cluttered with lots of other data, and it’s not editable. Paper notes aren’t scalable enough. And so on. 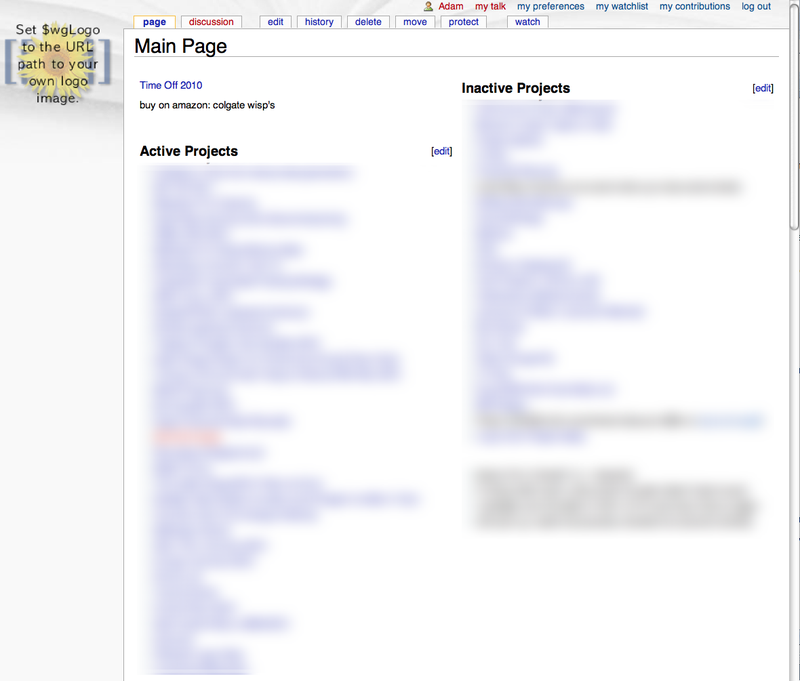 I inaugurated my personal wiki two and a half years ago. Since then I’ve created 480 pages and made 4,046 revisions which works out to over four edits per day. I’ve found it to be incredibly useful. Now lots of other people have written about personal wikis, so I’m going to just assume that you understand the basic idea, and talk about my tips on how to effectively use one. Use MediaWiki. At least as of 2008 it was by far the best. Turn rich text editing off. Use the text-only markup editing mode. The only markup you need to know is: ===A section title===, [[Page Link]], [http://cnn.com HTTP Link], __NOTOC__ to disable a table of contents, start lines with a “* “ to get bullets, and use two blank lines to get a blank skip line. Avoid hierarchy of pages. Especially if you’re an engineer. Your Main Page should be the only page that is just a bunch of links to other pages. Hosting: set up SSL and make your site https only. Security: disable account creation, and disallow anonymous browsing. Register a domain name that is dedicated to your wiki, that only you use. Run the wiki on a fast server. I started on shared hosting and found that my page load times were multiple seconds. I now run my wiki on an old desktop machine, but an Amazon EC2 micro instance does just fine! That is it for us today, I’m Adam Smith. Thanks again for reading. We’ll leave you with Sting, and a cut off his new album*. Take it away. * Rather than Sting, I’ll actually leave you with a censored list of pages I keep on my wiki, or at least the first few alphabetically. Take it away. ...okay you get the idea. Please leave any tips of your own or other thoughts in the comments!